Have you ever dreamed of going on an African Safari? Me too. I am Georgia Evans and that was my dream since I was a child thumbing through the worn out National Geographic magazines. I am also pretty sure I did not miss one Tarzan show on TV. Wild images of elephants tossing water over their backs in a river, lions roaring, monkeys swinging in trees, cheetahs chasing down a gazelle for dinner, fierce African warriors with shields and spears all captured my active imagination. These images made me determined to go there one day. Well, it took me a long time but I finally achieved this incredible dream two years ago. Now, I am pretty much hooked and plan to go back. However, this time it is my plan to share the dream with others and you are invited to attend. With a little research I realized I could get larger community size water filters from Vestergaard to help these people. I found that they do not require batteries, chemicals or electricity to clean large amounts of water for a small village. Perfect for a remote village that does not have a well, electricity or plumbing! Can you imagine drinking this gunky water without a filter??? Me neither. Ick! Two years ago I successfully raised $2500 (online and offline) from generous people and did my first water filter project in Tanzania, Africa. The filters were ordered, shipped and actually arrived on time to my hotel in Tanzania, Africa. I remember feeling nervous because I wasn't sure if they would even be there upon my arrival in Africa or not...I also had to pay a $100 bribe to border guards between Kenya and Tanzania to get these water filters across the border. It was just expected. Anyway, they made it safely and my local trip guides, Victor, Juma & Richard at Top Guides, loaded them up on the safari vehicles. Then we all headed into the Serengeti to meet the Massai villagers at their hut village near the Ngorongoro Crater. The young chief greeted us with warm enthusiasm and directed us proudly to their little school, see below. It had a lot of hand painted wall decor, so it was obvious this was a special place for this small community. The room had school benches and chairs, some lovely cut window glass decor, a chalk board with a teachers table and that is about all. Lots of chickens roamed about inside and out. My African guides unloaded and carried one of the two filters into the school for the children. Villagers eagerly pitched in to help as these filters are pretty good sized and cumbersome to carry. Photo above is me unpacking and assembling the community size filter. Then everyone stood around and watched as I put the filters together. Lots of children of all ages were expectantly seated on their benches in the schoolroom as well. The Massai chief was very friendly and interested in having clean water. He listened intently as I tried to explain how to use the filters. It was clear that he felt deeply about helping his people have clean water to drink. Waterborne illness is a constant problem for them. However, I realized quickly, there was a good bit of a language barrier. This chief only had a few words of English and I did not speak Massai and my local guides only spoke Swahili. It was my mistake to assume that my local African guides would be able to talk with the Massai villagers. So, I was just kicking myself because it had never occurred to me to even ask if I would need a translator when we got to this village. My concern began to grow during this exchange as I was not certain if this chief understood all my words and hand signals or not. We also tried to discuss the 50 small individual size personal water filter straws they can carry or hang around their neck when they go out into the Serengeti to gather water, wood and herd their cattle. Eventually, we found ourselves laughing a bit and we decided to take the other community sized filter (I brought two) to the center of his village where his people had gathered to sell jewelry to our group and give an actual demonstration with water. Yes, laughter is a universal language! This felt like the solution to the problems so when we drove away I felt confident the filters would get good use. I loved this experience and I was so glad to be able to help these people with clean water and better health. It is a fulfilling and fun cultural exchange.....that makes a real difference to their quality of life. They stay healthier with clean drinking water. This is a unique opportunity and NOT something ordinary tourists will experience. We are making a difference one village at a time. So, last time I went and came home with all my photos many people asked how they could go to. Realize i am also going (on my own dime) to take photos of Africa. However I set up a group site where you can experience (help and volunteer if you want to) in the water filter project as well as go on safari with me. It is $4200 plus airfare and includes all lodging, transportation in Africa, airport transfers and almost every meal with some exclusions. Youth with responsible adults are allowed. 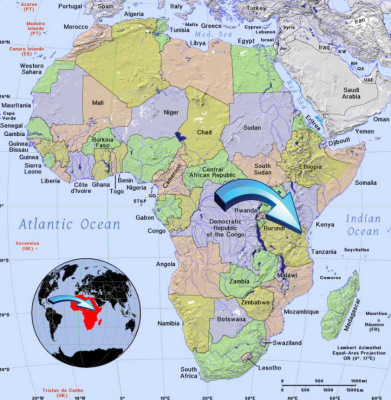 ​The water filters are then ordered from Switzerland and delivered into Tanzania via Kenya (I had to bribe the border guards at the Kenya border last time). They are then driven to our hotel in Arusha and our African guides will pack them onto the safari vehicle. We will deliver them by hand to another Massai village where we will assemble them and demonstrate how to use them. I am honored to be joined this next March 2019 by a Massai Chief, who has helped National Geographic better understand the Massai culture. This revered chief will be our project's Massai/English translator to help the tribe better communicate how to use the water filters successfully. 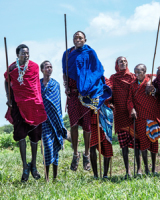 If we are lucky the Massai will invite us to join in on a famous traditional Massai jump dance. We will probably have an opportunity to buy some authentic Massai art and jewelry as well. I am sure it will be a wonderful visit. I know they will be grateful for clean water too. 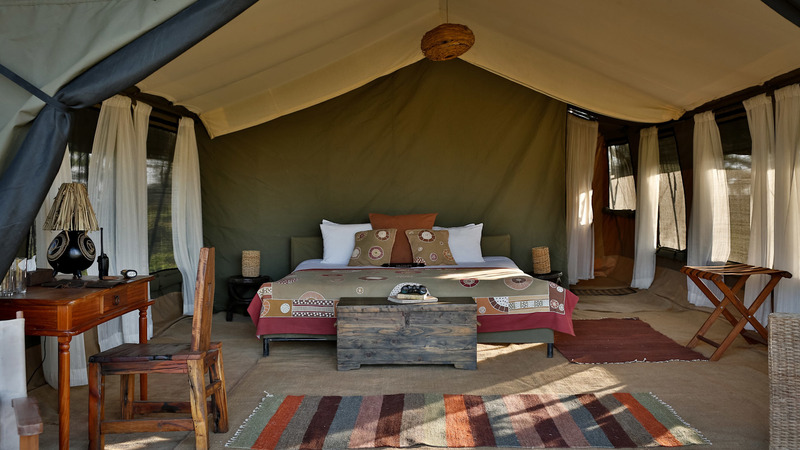 ABOUT OUR SAFARI: We will be staying in some amazing and lodges and safari camps. Good food, good beds, bathrooms and incredible locations! All accommodations on this trip have two beds or a double in very spacious rooms for 2 people (max 4). Some even have pools if you want to take a dip. Our English speaking local guides are very experienced and grew up in the region. They know the area, the wildlife and migration in the Serengeti to help ensure excellent wildlife photography. You will be exploring during one of the best times of the year to view wildlife. Our guides will do their best to provide front row seats to these wild and natural scenes. You will spend time in the best of Tanzania's Parks, home to what is considered the "Greatest wildlife spectacle on Earth". Nothing can prepare you for the millions of animals wandering on hillsides, going to watering holes and spread out over plains stretching to the horizon on their annual migration. This is very REAL, just like nature created it! While there can be no guarantees what all you will see ....elephants and swift cheetahs, to thousands of migrating wildebeests and zebras with their babies, water buffalo, rhinos, gazelles, leopards, giraffes and the mighty lion all call this place home. You might also see some of natures "clean up" crew of giant vultures, raptors and other smaller mammals like hyenas and cunning jackals. Many photos on this page are from my last African Safari. Note: please realize all these animals live wild here, they have to find food and water daily so we will always try to respect this. Your trip leader is Georgia Evans. She is a professional photographer who began shooting a Nikon as a layout editor for her college yearbook. She attended college on an athletic scholarship running the 400 mm hurdles. After graduation she became a teacher with classes in English, Art, Health, Phys Ed, and was the Head Coach at her school in Richardson TX. Later, Georgia resigned from teaching to move to Loveland CO to be with family in 1986. She opened up a sign, printing and graphic design company called Westwind Graphics. Part of her duties were also as a commercial photographer for her clients. Westwind Graphics just celebrated 25 years with an A+ BBB rating and has clients nationwide including many schools, cities and govt contracts. Georgia loves to teach, share and help beginner photographers. She is Certified with Wilderness First Aid/CPR/AED. She also has advanced Photoshop and Lightroom skills and will be sharing these as well. 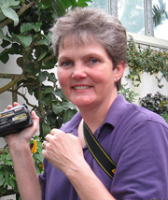 She has traveled around the world, sold her photos worldwide, and will be there to help you get the most of your African Photo Safari. Many of the photos on this page are hers from her last safari. Photos are courtesy of members of the last project & safari: Susan Inness, Wayne Simpson, Donna M Cavallaro & Georgia Evans as well as Vestergaard Lifestraw Water Filters. Many thanks. ITINERARY FOR WATER FILTER PROJECT & AFRICAN SAFARI - Includes meals beverages and drinks as indicated below. After breakfast (breakfast is included, drinks are extra) around 8.30am we will pack up and be transported from our hotel in Arusha on a scenic drive to the beautiful Ngorongoro Sopa Lodge where we will settle in for a 2 night stay (has won the World Luxury Hotel Award). This top class lodge is in a lush highlands forest on the rim of the ancient volcano overlooking the crater. ​Themed around traditionally circular African houses with conical roofs, and decorated with examples of Africa’s rich tapestry of artistic traditions by way of rich woodcarvings and sculptures, the lodge harmonizes perfectly with its dramatic surroundings. In the morning after a delicious breakfast overlooking the African plains we will wake up early and leave for our wildlife safari adventure as we descend down onto the floor of an enormous, ancient (non active) volcanic crater that is full of wild animals roaming about. The crater is also a World Heritage Site and has been called the eighth wonder of the world due to all of the wild creatures that call it home. It is famous for the it's 10 mile plains of rich short grass. The animals thrive here and raise their young like no other place in the world. The entire big 5 are often seen in one day as well as excellent predator interactions. ​Tere is also a lake often filled with flamingos. Throw in the rising crater walls all around you and you have a perfect backdrop made for an artist and camera. For people accustomed to city zoos this place will be an eye opener unlike anything you have ever experienced. These are not tame animals. They will not pose for you and you cannot pet them. These are wild creatures in a natural environment, just like nature intended. They are not fed by a zoo keeper. There are predators who must hunt and kill for their every meal. The herbivores must find grass, small creatures or insects for their dinner and stay ever vigilant they do not become someone's meal. They all have to constantly seek out water sources each day. It is very, very real! So please prepare yourself for beauty as well as predators who my have to kill for their supper. Note depending upom how many water filters we can buy and bring...we may visit a Massai Village on this afternoon to assemble and show them how to use them...we will be flexible here but we will be in the area where they live so it is a possibility. This year I am honored to have a local chief who has worked with National Geographic join us as our Massai Translator. He will help describe to the local tribesmen the "what and why's" of the community size Lifestraw Water Filters we will be showing them how to use. This experience is a truly unique way to visit with these people... no tourists get to experience anything like this ... as the Massai really want to have clean water and you will be truly welcomed. After breakfast we will start driving towards the famous southern Serengeti, home to the enormous migratory herds during the green season (Dec to Apr). This area consists of the world famous Serengeti plains. These nutrient rich plains are home to the enormous migratory herds of wildebeest, antelope and zebra during the green season. Wildlife viewing is spectacular in this area as over two million animals will be spread across the vast open plains making it the largest migration of land mammals on the planet. In addition to the large migratory herds, predators like lions, cheetahs and hyenas are abundant. This is the Serengeti at its best. It really is a sight to behold. We will be out all day on our game drive and will enjoy picnic lunch on the crater floor. After breakfast at the lodge, we will take a short flight back to the Arusha Airport. So, we will get a small taste of Africa by air. Our guides will drive us from Arusha to Kilimanjaro International Airport to catch an International flight home This takes about an hour. Please do not make your return flight before 2 pm on this day. Allow time in your return flight schedule to be at the Kilamanjaro Int'l Airport 2 hours before departure to get through security etc. (Flight and Airport Transfer included). ​This is unfortunately the end of the safari. We will put a facebook page where you can share images with your new friends and trip mates. The Serengeti offers a variety of options to the landscape and nature photographer. We will be heading out early mornings and late afternoon to drive out on the plains. These hours are the best for animal and predator movement and also for photography. 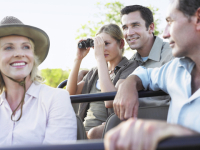 As is often the case in East Africa, "all day" game drives are common. These all day affairs include tasty packed lunches and water, of course. Midday hours are generally used to rest, talk about various sightings with new friends, discuss animal behavior and movement and photographic techniques. There will be some opportunity to get feedback on photos you take. Not A Photographer? That is no problem, you are welcome to come and enjoy the amazing adventure! If you just have a camera phone you can still take home some pretty good photos to share and remember it by. You can choose to not attend any photo discussions we have if you like. While we are mostly Nikon users we can help you learn how to use your DSLR camera and even help you get off AUTO. Want to learn how to make your photos pop? Georgia will show you simple techniques in photoshop and lightroom to make your photos have better contrast, fix some exposure issues, enhance skies and more! Be sure to pack your camera manual. We will share photos and talk about them. Ever wondered how to get more color into your skies? Want to learn how to photograph the night stars? Want to learn how to combine two cool photos? Are your photos too cluttered and busy? Are your photos dull or crooked? Georgia wil be there to show you some great photoshop techniques to enhance them so you will be proud to show them off. It is all a lot of fun. ​Meals are included as indicated in trip itinerary above. Some beverages and all premium & special drinks are extra. Water will be provided in our safari vehicles. A complete list of what to bring, daily itinerary, lodging info, suggested packing list, info on visas, passport, health and immunizations, what is included and what is excluded in the trip will be made available to interested people. You do not need to get a bunch of expensive "safari" gear or clothes. You will probably have all you need at home already. Simple layering, comfortable shoes and sun hat work well. You will also need to provide your own camera equipment (YES, non-photographers and or beginners are welcome). This is a land only trip. Airfare to JRO airport is extra. We will meet you at the airport and return you to the airport at the end of the trip (so long as you stay with the itinerary). Sometimes life gets in the way...You will need to get travel insurance for emergencies, cancellation, loss or damage, personal property, etc. Trip waivers, indemnity waiver & trip application form will all need to be signed. I have negotiated special group rates for us at all locations that will be held until March 30th 2018. Price is $4200.00 plus airfare & visa + see what is included/not included details. Price is based on double occupancy (I will help match up people if you like). A 50% deposit of is required to hold your spot and lock-in that price. Balance must be paid within 90 days for us to hold these reservations. Trip price is non refundable unless cancelled by us, see terms and conditions, as we will be paying our vendors in Early April. An English speaking trip leader and professional photographer. Experienced local (English speaking) African wildlife guides who know where to go to find the wildlife off the busy tourist paths. 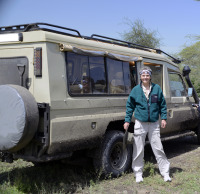 4x4 Air conditioned safari vehicles with open/close tops perfect for photography. Limit of four guests per vehicle. Night 1 in hotel in Arusha, dinner is extra. Breakfast next morning included - All beverages and bottled water are extra. Two nights at lovely Sopa lodge. All meals included, all beverages, bottle water and drinks are extra. African Massai tribal experience at one or two villages depending on how many water filters we can buy/bring. Several locations have swimming pools if you enjoy swimming. 3 Nights (a luxury) authentic bush Safari Camp with all inclusive meal plan including bottled water, beverages wine, beer. Hard & specialty drinks are extra. NOTE: We organize land only trips (unless noted above). Since our guests come from all over the world you will be responsible for obtaining your own flight to and from Kilamanjaro International Airport (JRO). Airfare to and from Tanzania, Africa JRO airport. You might try Bookit to get the best rates. This is who we use. Airport Transfers are included if you stay within the trip dates. However if you arrive early or stay longer then you will need to arrange your own transportation to and from Kilamanjaro Intl Airport (JRO). Taxis are available for hire. The hotel clerk can help arrange this. Passport that is current and does not expire within 6 months after date of travel. So if your passport expires before Sept 2019 you will need to renew it. Passport that is full and does not have enough pages will need to be renewed. VISA for entry and exit from Tanzania, Africa. For US Citizens you can get this at the airport when you go through the Port of Entry. The Tourist Visa in Tanzania is currently $100 and is good for 90 days. You can also get it online after you have obtained your flight info and passport info but allow a few weeks for this process. The Tanzania Embassy in Washington DC info is here. VISA: If you are not a US citizen please contact the Tanzanian Embassy for your country for details. Immunizations: Just like any other overseas trip you need to check with your doctor to make sure you are current and up to date on all routine vaccinations. Ask your doctor what is needed for this Tanzania. Some of these vaccines require more than one dose, or take time to become effective. It is always best to seek advice from your doctor on immunization well in advance, if possible around 6 weeks before departure. Travel Insurance: We highly recommend insurance coverage for cancellation and unexpected emergencies. This should be taken at or near the time you book the trip. We also recommend supplemental travel insurance to protect yourself in case of unplanned medical emergencies or evacuation and property loss or damage. We arrange land only trips. You might try Bookit to get the best rates on our Airline Reservations. This is who we use. Reserve your place here today ...spots are going to go pretty fast and get ready for the adventure of a lifetime! All accomodations are excellent, have real beds, with a bathroom in very spacious rooms for 2 solo travelers. Or, if you have family, spouses, significant others or travel friends we can put up to four in a room in two double beds. People traveling together and GROUPS of 8 or more should ask about discounts that are available call for quote. REPORTER HERALD: This made the local newspaper today. Many thanks to Shelley Windham and the Reporter Herald for the lovely story. Did you know you can join me on the next water filter project plus 3 day wildlife photo safari? Accepting deposits now to save your spot! Hurry, ­ book now, most tours sell out a year ahead of time and we need to make sure the airlines are not full. 50% Deposit now to secure your spot and balance due within 45 days. Price based on double occupancy as the number of tents are limited (if you are a solo traveler we can match you with a roommate). Single rooms are available only in Arusha and Ngorongoro...not available at safari tent camps. Meals and beverages and drinks are as noted in itinerary above. You may also call us with a VISA or MC number. ​​A 50% DEPOSIT of $2100 will reserve your spot. Balance is due 120 days before departure. See Terms and Conditions. Note: We reserve the right to change the price if you have not booked as well as keep a flexible itinerary and make substitutions of similar quality. Our itinerary is always subject to change due to weather, movement of wildlife, accomodations, vendors & suppliers that we have no control over. See Terms and Conditions . Sharing this link is very appreciated. 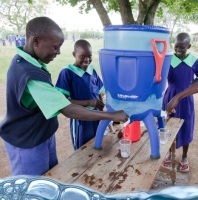 You also can donate to help buy water filters for an African Village here. The girls and women spend a good deal of time each day collecting water in buckets that they carry back to their village on their heads from remote streams and water sources often miles away. They also gather wood for cooking and boiling. The presence of a water filter will also help them reduce some of the tree cutting and wood gathering because they will not have to boil the water. WHY DO THEY NEED A WATER FILTER? These Massai villagers live in round mud houses with thatched roofs and hard packed dirt floors just as they have done for centuries. They have no running water, plumbing or electricity. Each hut has a small fireplace/hearth in the middle and the sides are walled off to make two rooms for sleeping and one for cooking. The mud/dung/grass/hay and stick huts are built completely by the women! I was amazed. Yeah, for women power. Thank you to our Business Sponsors for your support. Click on there card to visit them. "I have known Georgia Evans for over 20 years as a friend and the Ellis Ranch has done business Westwind Graphics. When Georgia posted via Facebook that she was looking for donations to help children in Africa with providing clean water filters it was definitely a yes for the Ellis Ranch. Knowing Georgia was going to hand deliver the filters made it a win win. People like Georgia are what makes Loveland a great community." "A gift that makes a difference!" "I hope you get to distribute these wonderful gifts to many women and children. What a great way to help!" 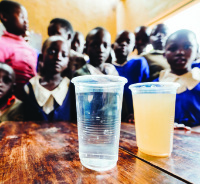 "I envision all those people can drink safe water and be healthy and happy!" "Thank you for doing this, Georgia! You are an Angel on earth." "That's so cool - so awesome you're doing this!" Stacia Fuller, www.myfavoritepainters.net/ Loveland, CO "Amazing!" "What a life changing gift , Georgia!"